Providing Full Auto Body Repair Warranties In Westfield for Over 20 Years! Once your vehicle is repaired at Westfield Collision Center you will receive a written warranty from your representative. 1. 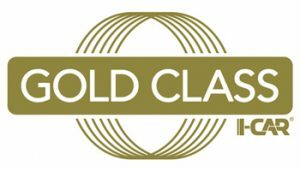 METALWORK: “Westfield Collision Center, Inc.” provides a Lifetime Written Warranty against defective workmanship to include welding and the application of materials utilized in making collision repairs against cracking, flaking, pitting, or deterioration. The Shop will, at its sole option, repair, and re-paint any metalwork warranted hereby. 2. PAINTING, STRIPES, AND DECALS: “Westfield Collision Center, Inc.” provides a Lifetime Written Warranty on painting-related priming and painting work against solvent blistering, peeling, hazing, and excessive loss of pigmentation; and a One (1) Year Written Warranty on the application and adhesion of decorative stripes and decals, excluding defects which are caused by extreme environmental conditions to which the vehicle may be exposed. 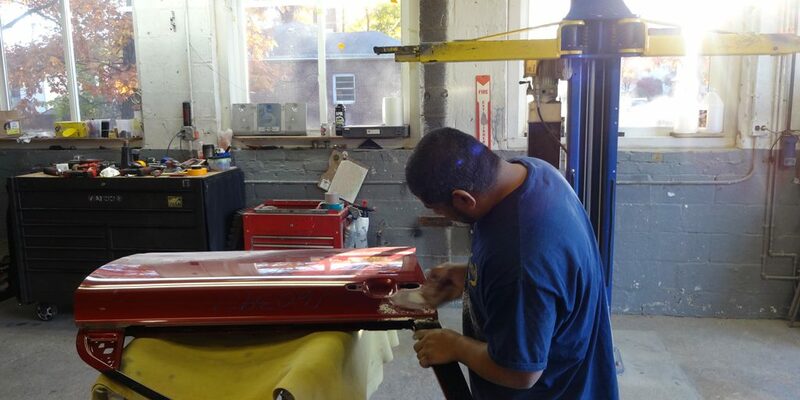 The Shop will, at its sole option, re-prime, repaint, re-stripe, or re-decal the specific section or sections of the vehicle warranted hereby. Paint Warranty is valid only when paint is applied over original factory finishes that are free of defect. 3. MECHANICAL REPAIRS: “Westfield Collision Center, Inc.” provides a One (1) Year Written Warranty on all mechanical repairs pertaining directly to original collision damage, excluding suspension, air conditioning, or other electrical assembles or components. The Shop will, at its sole option, re-repair any mechanical assembly or component warranted hereby. 4. PARTS: “Westfield Collision Center, Inc.” guarantees that parts or materials used are of the first quality. Those parts or materials are subject to the guarantee of that supplier. We will assist you in handling any claim under the supplier’s guarantee. We guarantee that that used parts or other than original equipment manufactured parts were not used without authorization from you as noted on the Repair Order. SPECIFICALLY EXCLUDED are incidental costs, such as towing fees, car rental charges, travel expenses, or assemblies and components which are not specifically covered by this WRITTEN WARRANTY, nor are consequential damages such as damage to other assemblies and components resulting from a defective part or installation of such part installed or repaired during the repair included in the WRITTEN WARRANTY. 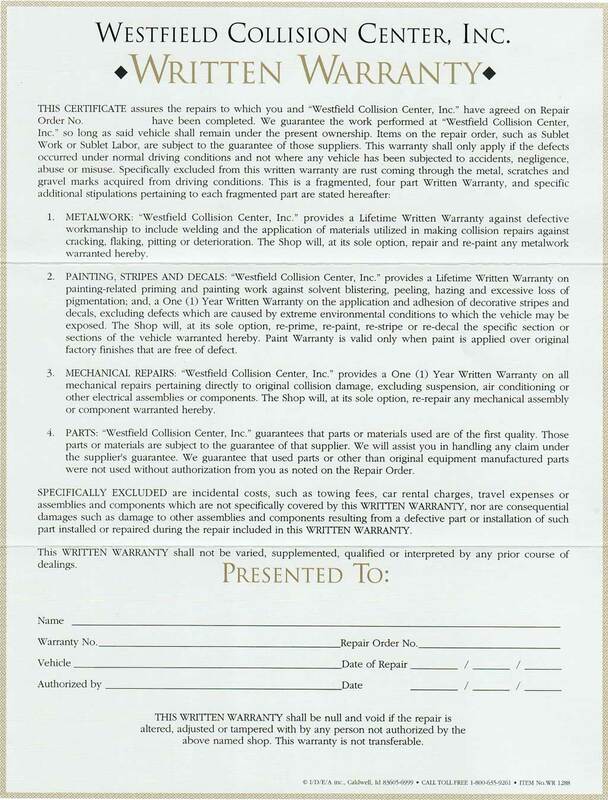 This WRITTEN WARRANTY shall be null and void if the repair is altered, adjusted, or tampered with by any other person not authorized by the above-named shop. The warranty is not transferable. Please contact us should you have any questions whatsoever!